Jiu Jitsu is not an easy sport to entice women into. At first glance it seems like a bunch of very sweaty guys rolling around. You can end up in all sorts of awkward positions, like a foot in your face (or worse!). I watched from the sidelines for several years and was not inclined to give it a try. I slowly tried a few classes here and there, and now I love it! For women first trying BJJ, the first month or two can be discouraging. You really have no idea what to do, and it basically feels like you are struggling while someone tosses you around and pins you down. Once you learn a few techniques, you begin to know what to do, how to escape positions and try for submissions. You forgot about the weirdness factor of having no personal space and realize the whole thing is a chess match. You make moves and countermoves, while trying to pay attention to your partner’s moves so you don’t get caught. I read several articles on women wanting to start in women only classes. I started co-ed and have only had a few women training partners, and to be perfectly honest, I have found the girls to be rougher than the guys! I would suggest to women who want to start in the sport, it is not necessary to seek out an all female class, rather seek out a school that offers a safe and controlled training environment. Open mat is free time for anyone to come and roll. There is no technique taught and typically all belt levels can come. This is not the place for a beginner. You need to learn technique first. Jumping into rolling before learning technique is like jumping into the deep end of the pool before learning to swim. It is perfectly okay to only train technique in the beginning. You can either watch class or leave when it comes time to roll. Make sure to find a school where at least the first ½ of class is devoted to learning and drilling a technique. If you get paired with someone who is too rough during the technique, ask them to slow down or ask to switch partners. If you have a good instructor you can ask them before class to pair you with someone. Take your time in figuring out who you will be comfortable rolling with. There are all types of people in the world and all types of rolling partners. Good training partners are ones that flow, use technique, and are not always going for the kill. Great training partners are okay to stop and teach someone new during training. For the most part avoid rolling with white belts, even when you are a white belt. Training technique with them is fine, but when it comes to rolling they have no idea what to do and often panic and make fast explosive movements. If you are a woman and they are considerably larger or stronger than you, chances are you are going to get hurt. Even as you progress in rank I would avoid rolling with most white belts, let guys of similar size and strength teach them how to slow down. Realize that if YOU train wild and explosive, you can’t expect your training partner to go light. If you try to rip moves, stack, crank or explode, your partner will have to adjust to protect him or herself from getting hurt. Be aware of your actions, don’t crank on anyone’s neck, and don’t make out of control moves and knee, elbow or smack your partner. If you get in a position to submit, do it in a slow and controlled manner, giving your partner time to tap. Be the good training partner you would like to roll with. There will be days that there is an odd number of people, days that all the guys rush together and you are left out. If it happens during technique, ask to work in with another pair. If you are left out rolling, sit on the sidelines and watch. You can actually learn a lot from watching. You may not get to roll every class, and that is okay, over time you will develop regular training partners you can rely on to roll with you in a safe and controlled manner. What to do with your hair? Personally I’ve tried two styles; pigtails and a top bun. I’ve seen girls roll in just a ponytail or even with loose hair and I’m not sure how they do it. In the close quarters of BJJ it is easy to have someone post their hand or foot on your hair, and once your head is pinned to the floor, you are pretty much stuck! A bun in the back does not work well as you have a big knot of hair to lie on. Short hair can be left loose. The pigtails stayed in well, but would get posted on. I gave up the pigtails when I got one stuck in someone’s headgear. I’ve found the top bun to be the best way to keep my hair out of the way. I also like to use a headband to keep the flyways out of my face. Ones with a velvety underside actually stay put- my favorites are Razzy Roo headbands. To train BJJ you will need to keep your nails short, long nails and BJJ just don’t mix. You do a lot of gripping with the hands, and long nails will get ripped off. If you look around at guys that have trained a long time, you do not want your feet to look like that! I found initially that I was getting blisters on the tops of my toes and tearing up my big toenail. If I had a manicure, forget it, it would be chipped. I tried taping, which was a bit of a pain to put on and take off. Wrestling shoes are an option, but some schools do not allow them and I think they can be inhibiting. Regular socks are too slippery on the mat. I opted for toe socks with grips on the bottom, and even though I’ve gotten a lot of teasing for them, I love them! I tried Injinji and ToeSox brands. I found the grips to last longer on the ToeSox brand. If you shop clearance on their website, they are only about $10 a pair and come in all sorts of colors. Choose a good comfortable sports bra. My favorite is the Moving Comfort Fiona bra. I like that they clasp in the back so I don’t have to wrestle out of them once they are wet. Any bra that is supportive and does not poke you when you lie on your back will work. You can wear either a t-shirt or rash guard, t- shirts sometimes twist and bunch too much, I’ve found the rash guards to be preferable over time. My favorites are Fuji, they are extra long to stay tucked in and come in super cute designs. There are many Gis these days geared toward women, they are cut to fit a woman’s body and come with cute girly designs. Men’s Gis will work, but often fit too baggy. My personal favorite is the Fuji Blossom Gi. The fit is great, nice soft fabric and super cute design. The best part is it is also one of the less expensive Gis. I would highly recommend these as a first Gi for women. My second favorite is Inverted Panda. While they do not have a women’s specific Gi, they do have a slim fit. They are super soft and comfy; my only complaint is the top tends to stretch out a little when training. I liked the one white so much; I got a gray one too. My Badger Gi comes in third. The color and design are great, and the black has not faded with multiple washes. The only con I noticed is that the reinforced seat tends to feel like diaper when I first put the Gi on, but once I’m rolling around I don’t notice it anymore. My combat corner Gi was my first GI. It is not specific to women, and is pretty much a simple no frills Gi, but it does fit well and is comfortable. It is a good starter Gi if your instructor can get it wholesale. My least favorite Gi was sadly the one I spent the most money on. I choose the Breakpoint Gi for the cool design. I noticed when I got it, the collar seemed stiff and I thought it would improve over time, but it actually got worse. The black also faded horribly. Overtime the whole top began to feel stiff and binding. So far, this is the only Gi I’ve retired and no longer use. There are many brands I have not tried. I typically will not spend more than $100 on a Gi. I have caught some on sale, but some are just too expensive. I have looked at Fenom Gis, but for my taste, the design is a little bland. Another girl at my school has one, and she does like the fit and soft fabric. BJJ is a great sport for women. You can still look like a girl, train hard and NOT GET HURT. Aside from little bruises on my arms and legs the only time I have been hurt was when I twisted off the mat at an angle and yanked my pinky toe (before the ToeSox!). I am lucky to train at a school where students are taught to flow and be in control while training. Injuries are rare. This is not the case at every school and I encourage women to watch a few classes before joining a school. You should feel comfortable with the instructor, make sure they do not allow derogatory comments to women and that they keep an eye out for their female students. 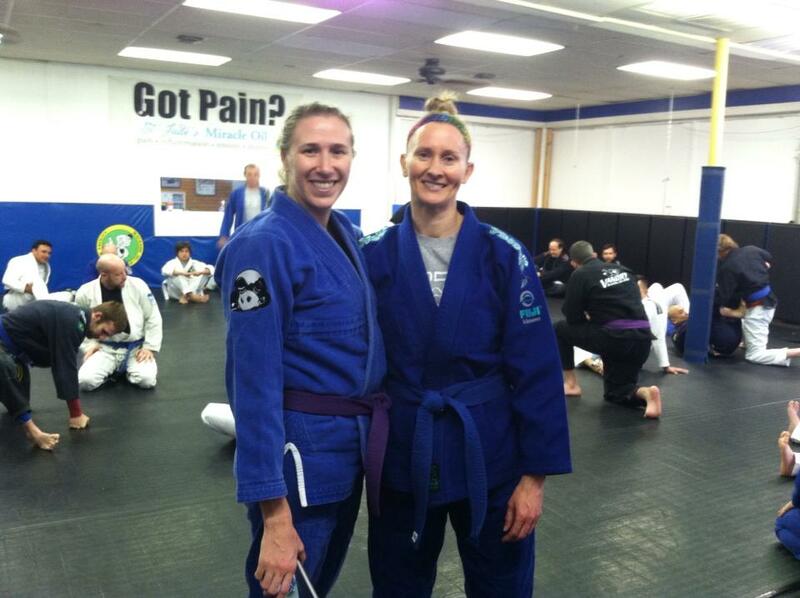 Chandra is a two stripe blue belt and trains at Vandry Brazilian Jiu Jitsu in Austin, TX.